Cecilia Bridget Rebescher was born on September 30, 1895, in Buffalo, New York. She was baptized on October 7, 1895, by Fr. Ferdinand Kolb of Saint Boniface R.C. Church, 124 Locust Street, Buffalo. Her sponsors at the baptism were August and Frances (née Schwertfeger/Schwert) Schlia/Schlee. 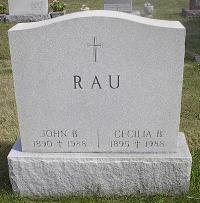 Cecilia's baptism records indicate that she married John B. Rau on June 26, 1937, at St. Mary of Sorrows R.C. Church, Buffalo, NY. Cecilia and John had no children. Cecilia was a nurse and trained at Father Baker's Our Lady of Victory Hospital (O.L.V.) in Lackawanna, NY, across from the basilica that Father Baker had built. Cecilia died at the age of 92 on March 12, 1988, in Buffalo. John died at the age of 98 on December 12, 1988, in Buffalo. At the time of the deaths, the couple resided at 116 Davidson Avenue. Both are interred in Lot 1085, Sec. A., Mount Calvary Cemetery (Pine Hill), Cheektowaga, NY. 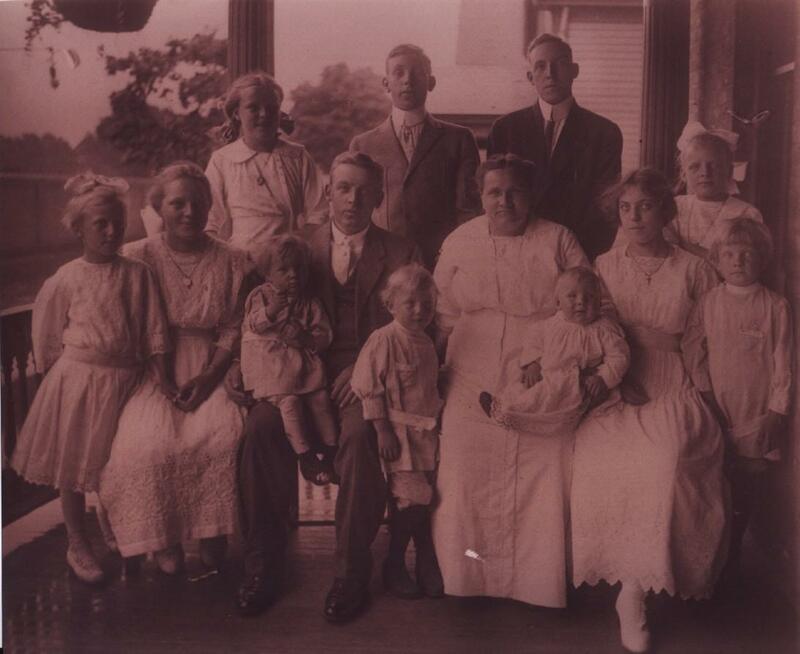 Family records provided by Geri Ellerbrock indicate that Cecilia's next of kin was Herbert Burge, a nephew who resided in Buffalo, NY. 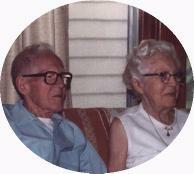 John and Cecilia Rebescher Rau. (Photo courtesy of Don Mack). General location of graves for Cecilia (née Rebescher) and John Rau, Lot 1085, Sec. A., Mount Calvary Cemetery (Pine Hill), Cheektowaga, NY. 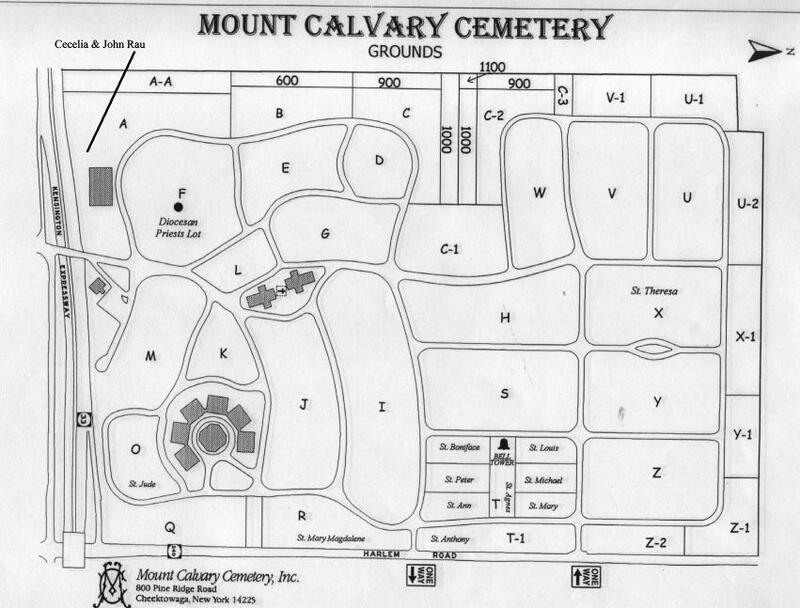 A map to the gravesites is available here. 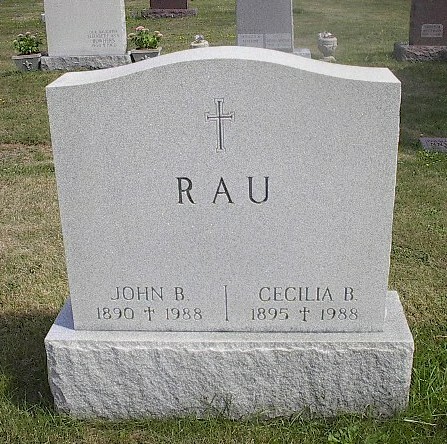 Grave of Cecilia (née Rebescher) and John Rau, Lot 1085, Sec. A., Mount Calvary Cemetery (Pine Hill), Cheektowaga, NY. 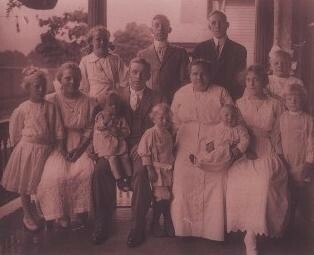 Baptismal Record: Cecilia Bridget Rebeski, born September 30, 1895. Baptized on October 7, 1895, by Fr. Ferdinand Kolb of Saint Boniface R.C. Church, 124 Locust Street, Buffalo, NY. Sponsors were August and Frances (née Schwertfeger/Schwert) Schlia/Schlee. Marriage Record: Cecilia Bridget Rebescher, to John Rau, June 26, 1937, St. Mary of Sorrows R.C. Church, Buffalo, NY. 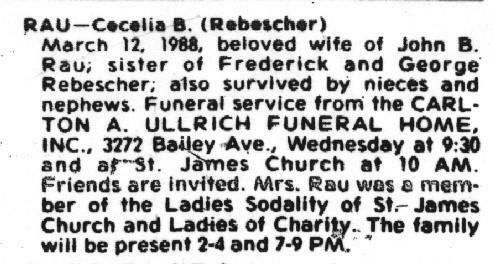 Obituary: Cecilia Bridget (née Rebescher) Rau, March 12, 1988. 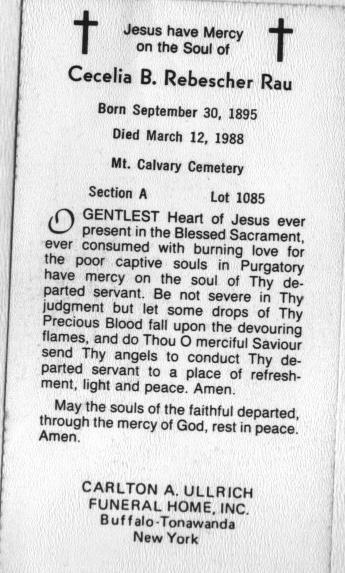 Funeral Mass Card: Cecilia Bridget (née Rebescher) Rau; born September 30, 1895, died March 12, 1988; interred in Lot 1085, Sec. A., Mount Calvary Cemetery (Pine Hill), Cheektowaga, NY. 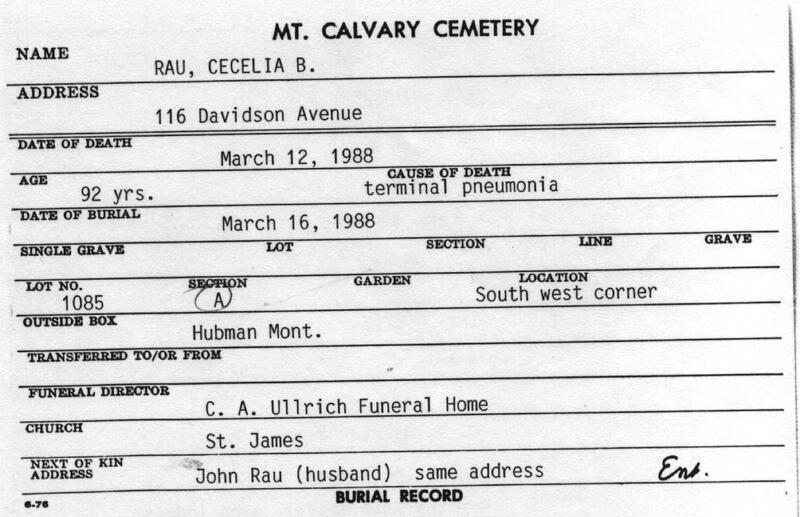 Interment Record: Cecilia Bridget (née Rebescher) Rau, Sec. 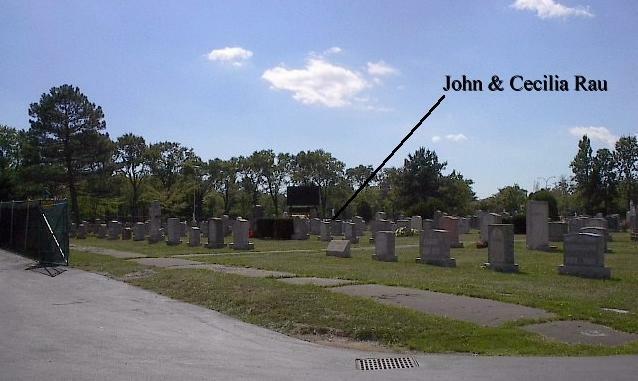 A, Lot 1085, Mount Calvary Cemetery (Pine Hill), Cheektowaga, NY. 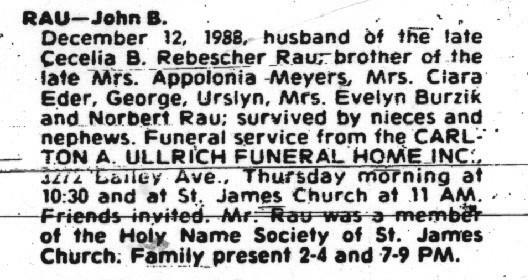 Obituary: John B. Rau, December 12, 1988. 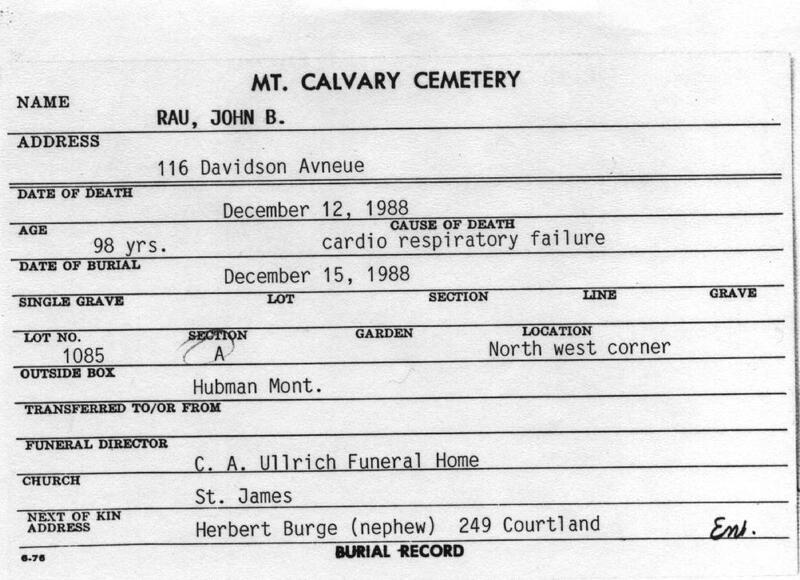 Interment Record: John B. Rau, Sec. A, Lot 1085, Mount Calvary Cemetery (Pine Hill), Cheektowaga, NY. 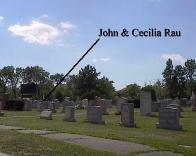 Cemetery Plot Map: Gravesites of Cecilia (née Rebescher) and John B. Rau, Sec. A, Lot 1085, Mount Calvary Cemetery (Pine Hill), Cheektowaga, NY.